Karen Howard is Assistant Professor of Music Education at the University of St. Thomas. Jamey Kelley is Assistant Professor of Choral Music Education at the University of North Texas. 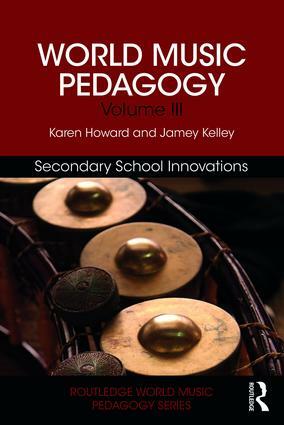 The Routledge World Music Pedagogy Series encompasses principal cross-disciplinary issues in music, education, and culture in seven volumes, detailing theoretical and practical aspects of World Music Pedagogy in ways that contribute to the diversification of repertoire and instructional approaches. With the growth of cultural diversity in schools and communities and the rise of an enveloping global network, there is both confusion and a clamoring by teachers for music that speaks to the multiple heritages of their students, as well as to the spectrum of expressive practices in the world that constitute the human need to sing, play, dance, and engage in the rhythms and inflections of poetry, drama, and ritual.